Would You Recognize These 67 Sneaky Names for Sugar? What Is a Probiotic Diet? Sugar is used as a preservative in many foods. Probiotics, whether naturally occurring or added to foods, are affected by high-sugar environments. Certain probiotic strains have a natural acid-bile tolerance, giving these bacteria the ability to survive digestion in the intestines. Probiotics do not affect levels of the natural bacteria present in the gut. The United Nation's Food and Agricultural Organization and the World Health Organization define probiotics as "live organisms, which, when administered in adequate amounts, confer a health benefit on the host." Intestinal flora, or "friendly bacteria," occur naturally in the human gut. Two examples, lactobacilli and bifidobacteria, found in the human intestines, are commonly used as additives in yogurt and other foods and supplements, reports Abbot Nutrition. 'Live cultures' refers to bacteria associated with foods, such as those present in fermented milk, the original source of yogurt. Sugars present in certain yogurt products and other probiotic-containing foods apparently do not interfere with the digestive processes of good bacteria in lower parts of the small intestine, according to USProbiotics.org. The organization, however, goes on to say that studies comparing identical probiotic foods with and without sugars have not been conducted. Food preservation utilizes concepts based on bacterial cell breakdown under high-sugar or high-salt conditions, reports the University of Missouri. An environment rich in sugar or salt draws water from cells, causing the cell walls to break down and eventually leading to cell death. The food industry has maintained a balance between the amount of sugar needed to preserve foods and the viability of probiotics in foods. The American Society of Microbiology reports that the ability of certain probiotic strains to survive passage through the intestinal tract is due to the organisms' acid and bile tolerance. This survival ability can be enhanced by the addition of sugars during food production that are easily metabolized in the human gut. The Society recommends that probiotics be regularly ingested. The University of Reading reports that milk protein, lactose and other sugars influence the survival of probiotics in the gut. The University goes on to note that varying pH environments throughout the digestive system influence different strains of probiotics in different ways. Some strains survive passage through the stomach while others survive the rest of their course through the digestive tract. Adding multiple strains of probiotics to food products guarantees that some of the probiotics survive the entire digestive process. Probiotics make insignificant changes in the level of intestinal flora, according to the University. 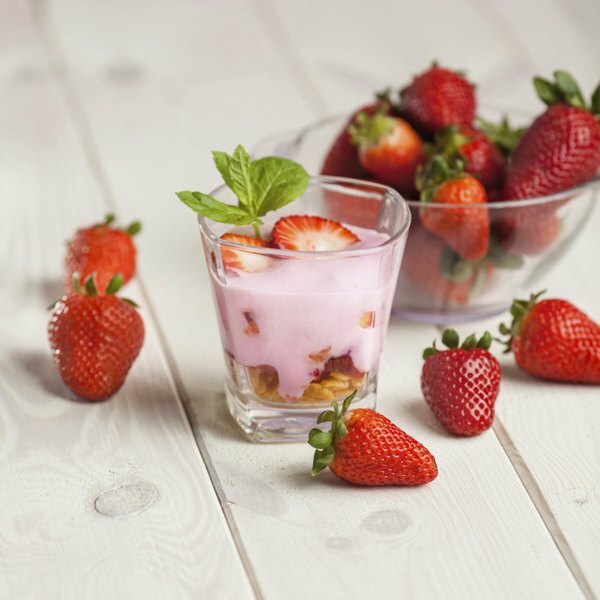 Current research in the food industry is directed at finding foods, aside from dairy products, that will be suitable for addition of probiotics. Karen Klefstad began her writing career in 2010. She writes health and travel articles for various online publications. Klefstad is a radiation therapist and holds a Master of Science in clinical and administrative gerontology from National-Louis University. Can Avoiding Certain Foods Prevent Bacterial Vaginosis?